All types of grazing stock continue to sell sharply to peak at £1,280, 610kg Limousin steer (210.00). Heifers peaked at £1,195 for 635kg Charolais (188.00). Dropped calves cleared to £375 Simmental bull and heifer calves to £350 Hereford heifer. Weanlings sold to £1,000 for 525kg Charolais steer (190.00) and weanling heifer calves sold to £990, 360kg Charolais (274.00). Steer prices continue to sell sharply to peak at £1,280, 610kg presented by S McKenna, £1,210, 575kg Simmental (210.00), £1,210, 585kg Limousin (207.00), £1,205, 590kg Simmental (204.00), £1,200, 585kg Simmental (205.00); I Jardine £1,240, 590kg Belgian Blue (210.00), £1,155, 565kg Hereford (205.00); A Williamson £1,230, 590kg Charolais (209.00), £1,215, 600kg Charolais (203.00), £1,200, 595kg Limousin (202.00), £1,160, 570kg Limousin (204.00); G Ferguson £1,180, 545kg Limousin (217.00); L Kerr £1,140, 520kg Limousin (219.00), £1,070, 500kg Limousin (214.00), £1,030, 515kg Limousin (200.00), £970, 475kg Charolais (204.00); F Stewart £1,110, 490kg Limousin (227.00), £1,040, 495kg Limousin (210.00); V Allen £1,085, 505kg Hereford (215.00), £1,060, 490kg Aberdeen Angus (216.00); F Devlin £950, 470kg Charolais (202.00), £900, 430kg Charolais (209.00), £860, 420kg Charolais (205.00); S Swain £945, 470kg Belgian Blue (201.00); G Clarke £920, 445kg Aberdeen Angus (207.00), £900, 430kg Hereford (210.00) and J Ferry £840, 390kg Limousin (215.00). Heifer prices cleared to £1,195, 635kg Charolais (188.00) presented by O Mulgrew, £1,180, 605kg Limousin (195.00), £1,095, 560kg Limousin (196.00); P Quinn £1,170, 515kg Limousin (227.00), £995, 475kg Limousin (210.00), £950, 465kg Limousin (204.00), £950, 465kg Limousin (204.00); S Davidson £1,010, 505kg Limousin (200.00), £990, 470kg Limousin (210.00); B Holland £970, 470kg Limousin (206.00) and J Holland £960, 495kg Charolais (194.00), £920, 470kg Limousin (196.00), £900, 455kg Limousin (198.00). Dropped calf prices continue to sell sharply to peak at £375 for a Simmental bull presented by R Burns; P Robinson £305 Simmental bull, £240 Simmental bull; J Robinson £305 Limousin bull; S McMullan £305 Aberdeen Angus bull, £285 Aberdeen Angus bull; M Robinson £300 Limousin bull; E Speers £300 Belgian Blue bull, £300 Simmental bull, £275 Hereford bull; T Lester £295 Limousin bull, £250 Limousin bull, £230 Limousin bull, £220 Limousin bull; T Muldrew £285 Hereford bull, £220 Hereford bull; S MaGennis £280 Aberdeen Angus bull, £240 Limousin bull; D and W Trouton £270 Fleckvieh bull and W Smith £245 Hereford bull, £200 Hereford bull. Reared Friesian bulls sold from £75 to £145; heifer calves peaked at £350 Hereford heifer presented by N Muldrew, £295 Hereford heifer; T Muldrew £320 Hereford heifer; S McMullan £250 x 2 Aberdeen Angus heifers, £225 Aberdeen Angus heifer; P Robinson £245 Simmental heifer, £240 Simmental heifer, £235 Simmental heifer, £225 Simmental heifer; G Blair £210 Friesian heifer; T Lester £205 Limousin heifer and R Givan £200 Limousin heifer. 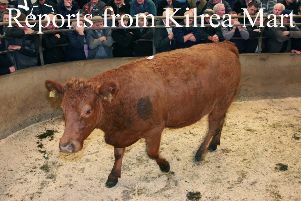 A quality entry of weanlings saw prices peak at £1,000, 525kg Charolais bull (190.00) presented by K McCaffrey; J Lennox £980, 450kg Limousin (218.00); M McVeigh £960, 420kg Charolais (229.00); R Lester £955, 420kg Limousin (226.00); D Barker £945, 435kg Limousin (216.00), £870, 375kg Belgian Blue (231.00), £750, 310kg Limousin (240.00); O McAnespie £935, 410kg Charolais (228.00), £825, 295kg Charolais (278.00); C McAninley £910, 365kg Charolais (247.00), £860, 325kg Charolais (264.00), £735, 265kg Charolais (275.00); S Morrison £890 380kg Limousin (235.00); J McAninley £865, 330kg Charolais (261.00), £840, 345kg Charolais (241.00); M McNally £860, 290kg Limousin (294.00); M McVeigh £815, 340kg Limousin (238.00), £755, 310kg Limousin (244.00); M McCrory £810, 310kg Charolais (258.00); T F Smyth £730, 285kg Charolais (255.00); J Waugh £690, 265kg Charolais (259.00). Weanling heifers sold exceptionally well to peak at £990, 360kg Charolais (275.00) presented by O McAnespie, £700, 315kg Limousin (221.00); S Morrison £930, 390kg Limousin (237.00), £840, 365kg Limousin (231.00); T Lester £915, 420kg Blonde d’Aquitaine (217.00), £895, 375kg Limousin (237.00); K Burrows £900, 410kg Limousin (220.00); M McNally £845, 265kg Limousin (315.00), £805, 325kg Limousin (246.00); S Sinnamon £810, 340kg Limousin (238.00); J Waugh £800, 285kg Charolais (281.00), £800, 310kg Charolais (261.00), £670, 310kg Charolais (217.00); S Slean £760, 340kg Limousin (222.00), £635, 290kg Limousin (218.00); B McKenna £685, 315kg Limousin (218.00); W Abraham £660, 300kg Charolais (219.00); J Livingstone £600, 265kg Shorthorn beef (226.00) and D Mahon £590, 230kg Limousin (258.00).